The reality of returning to Texas had suddenly shown up. I was back—not returning the way I’d come before and for a much longer stretch this time—but I was here once again. Back in that state I’d never had an inkling of desire to visit for the second time in less than two months. Four weeks ago, I’d made a decision that propelled me into a lightning-fast series of actions: move to Texas—which meant resigning from my job, getting rid of 95% of my stuff, shoving most of my remaining belongings in a tiny storage unit, saying a lot of goodbyes, and setting out on an epic cross-country road trip with my mom and sister. …As we moved ever-closer to my new landing spot on the other side of Dallas, I saw it. Peeking from behind the clouds, backlit by the setting sun was a barely-there rainbow. You know those steps you sometimes take that propel you forward a bit faster than you would’ve liked, but couldn’t stop once you were in motion? None of the metaphors I’ve come up with thus far really do justice to this feeling. For example, I’ve thought of images that range from the stumbling steps of walking off a moving sidewalk too fast and almost running yourself over with your baggage (hello, ATL airport–not that I would know, personally, of course) to jumping out of a plane and forgetting you even have a parachute. Nothing suffices to describe all the feelings. I’m a words girl. If you’re reading this, you clearly already know that. The written word is my preferred method of processing; I live and breathe by the written word. (Thoreau didn’t coin the “choicest of relics” phrase without cause, people.) Most of the time, putting my thoughts and feelings into words comes fairly easy. Not so much this week. For starters, it’s been such an incredibly weird week that I’ve been unable to articulate exactly what I’ve felt. When a blog post starts percolating in my brain, it usually stems from a single word or phrase. Since I arrived in Texas Saturday evening, I’ve been asked several times, “How are you? How are you feeling?” And I haven’t had any words other than “weird” and “floundering” to answer those questions. Until this morning, when Anna and I had chat about this crazy-good thing I’ve done. And suddenly I had my word: surreal. “What you are doing is surreal. Look it up—what’s the definition of surreal?” she asked. “’ Marked by the intense irrational reality of a dream,’” I replied, after a quick Google search. This thing that I’ve done in the last month—returning from a weekend retreat and moving halfway across the freaking country? It sounds crazy, looks crazy, and could very well be crazy. I know. Believe me—I KNOW. But if I look back over the last few years—and the last year in particular, I cannot help but see a trail of markers—breadcrumbs, if you will—that have lead me here. Last summer life was much the same as it had been for the last three—I was surviving, going through the motions of everyday life, pretending I was as happy as I might have seemed. Don’t get me wrong—there were plenty of good things and people in my life, but I was not living life to the fullest. The Gallaudet incident sucked far more out of me than it should have, perhaps, but it left me broken, empty, and trapped in fear, anxiety, and depression. And although I had stumbled into #the4500 Facebook group earlier in the year, I was not very engaged there…yet. Only one of them was my actual Facebook friend—and that was Anna, who had sent a request in April. In July, I commented on a post where folks were posting screenshots of Jen Hatmaker’s interactions with us on Twitter, leading Anna to find me on Twitter and follow me. That was, for the most part, the extent of my interaction with the group. And then September came, and I was reading Daring Greatly, and next thing I knew Anna and I were talking on the phone for the first time…and here I am, barely nine months later, typing this blog post in her house. If that isn’t surreal, I don’t want to know what is. Since that first phone call in September, way too many “little” things have happened for me to ignore their significance–one of which Anna reminded me of this morning: “The ENTIRE East Coast shut down in January…for YOU…so I could meet not only you, but your mom and Jess, too…” Yes, I suppose you could look at it like that. Thank you, Snowpacalypse 2016. 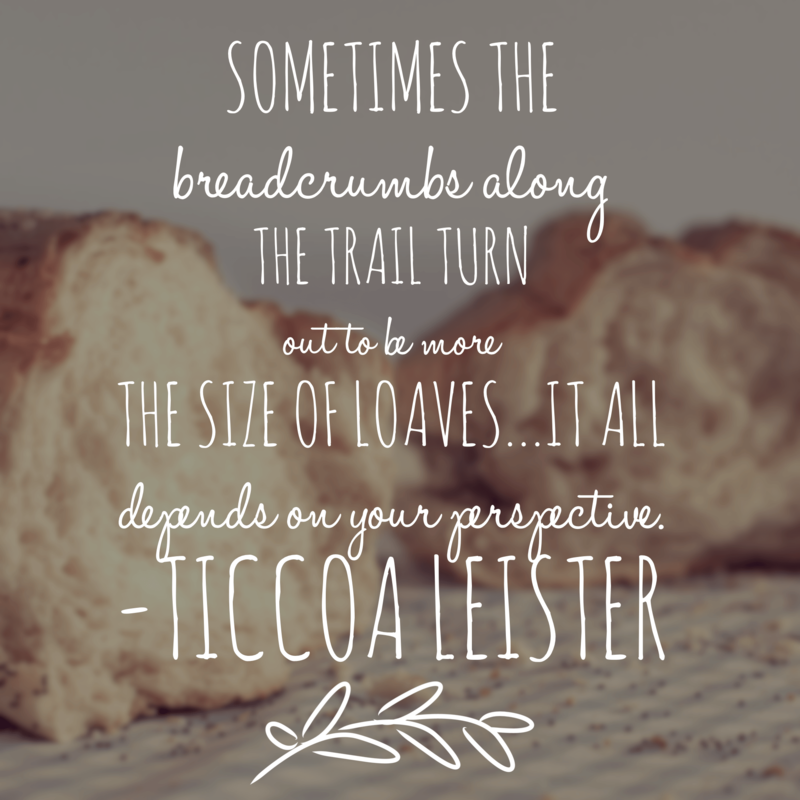 Sometimes the breadcrumbs along the trail turn out to be more the size of loaves–it all depends on your perspective. All those “coincidental” events might’ve looked like breadcrumbs a few months ago, but from where I sit today, they look a bit more like loaves I was handed to feast upon. A week ago today, I loaded a few boxes and bags into trunk of my mom’s car and embarked on a two-day, one-thousand mile road trip with the two most important women in my life. I’d originally intended to fly to Texas, but I’m incredibly grateful that Mom and Jess decided to drive me out. We had a blast as we crossed five state lines and made some fun stops along the way. But perhaps the greatest reward of the journey was their meeting and spending time with a few of the women who have impacted me the most in #the4500—Anna, Rachel, and Julie. It’s really difficult to explain the culture of #the4500 to those who aren’t a part of it; it was hard for me to understand it until I arrived at Splendid. But because they got to experience it firsthand, I believe it was easier for all of us to part ways on Monday afternoon. When Mom turned to me just before she and Jess departed and said, “You’ve got good family here,” I knew she understood—maybe not fully, but enough to know I was not going to be left to flounder my way through this transition. Leaving SC wasn’t easy. Some of my very dear friendships have had to shift in order to survive the transition. That breaks my heart, but I know it is necessary and I’m willing to make space for those friendships to find a new rhythm. I’m so thankful for all the people who have cheered me on. In the two weeks leading up to my departure, I had so many wonderful conversations with friends who wanted to know all about how God has worked to orchestrate this venture—Christine, Cathy, Julia, Becky, Angi, Camille, Kayla, Olgui, Susan & Mary Carol, Jenna & Melissa, Susan & Lisa, Brent & Shannon…I’m sure I’m leaving people out. I wish I had all of those conversations in written form to reflect on. What I do have is the knowledge that you are my tribe. You are praying and cheering from the stands of the arena. For that, I am so thankful. I won’t lie and say this week has been easy. It hasn’t. For several hours Monday afternoon and evening all I could do was lie on the couch and breathe. My heart was racing and I almost felt trapped. I didn’t say a word for 24 hours. In the days following, I’ve been in a mostly calm state of mind, but there have definitely been moments when I’ve let myself question everything about this move. For those of you have texted to check in—Kelli, Christine, Taylor, Julie—thank you for caring for my heart. And Anna, of course, gets a heap of thanks and admiration from the depths of my heart for welcoming me into her home. So, for now, my plan is to just do the next right thing and let Him handle the rest. He’s already got the loaves waiting along the path ahead.